RANTWICK - Commuter Cycling in London Ontario | A Bike Blog: Identity Theft - I've Lost Face in a Rachael Ray opinion poll! 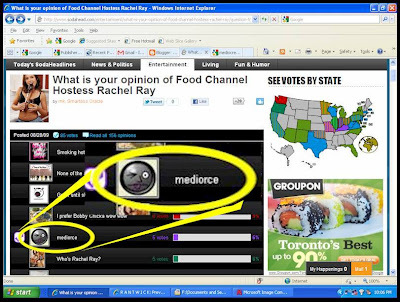 Identity Theft - I've Lost Face in a Rachael Ray opinion poll! I have a peculiar affection for my little Rantwick face. I made it as part of the very first website I ever published about 10 years ago. That site has been retired for about 5 years and isn't available any more. He was the image link for "Odd Stuff" or something. This little face has become more than a simple button to me. He is my blogging alter ego. I paste that head on stuff. That head is Rantwick and Rantwick is "me". Copyright Ham@londondailyphoto.com . Click pic for source web page. 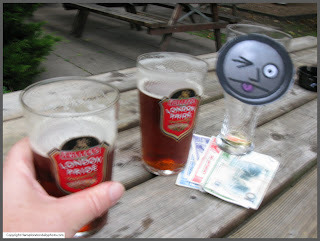 I get a great deal of pleasure from people using my Rantwick head in creative ways. Except when it isn't Rantwick at all. My little guy has been demoted to "button" status once more. Not only that, but he is being used to call TV cooking show hottie Rachael Ray "mediocre" (if you can possibly believe it) in a poll found on an opinion site called sodahead.com. The site isn't really to my taste, but looks like it is pretty popular. C'mon, man, mediocre is even spelled wrong! So sad. Chin up, little guy! 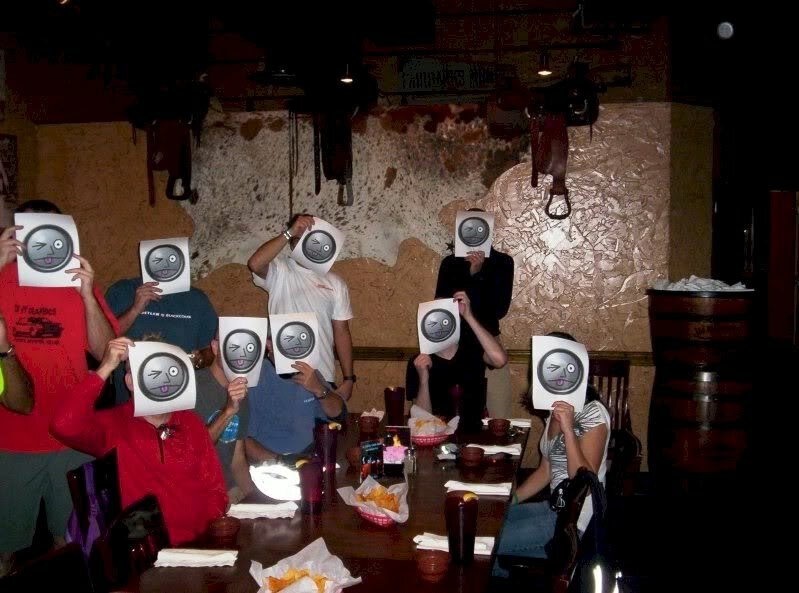 It would be hypocritical of me to be crabby about others using the image, since I use images from the web all the time. I try to remember to link to sources and give credit, but my record is by no means spotless. In any case, this only bugs me because I have begun to think of that little guy as a reflection of myself, or at least of this blog. I signed up for the site just so I could leave a comment about this misuse of my face. Mediorce? Me? Impossible. 1. A divorce mediated by a third party. 2. A divorce caused by medical concerns or issues. 3. A divorce conducted during the Middle Ages in Europe, usually characterized by the killing of one of the betrothed. 4. A divorce caused by inappropriate spousal behaviour at a Medieval Times dinner and show. 5. The divorce of married doctors, usually characterized by lawyers making tons of money. 6. 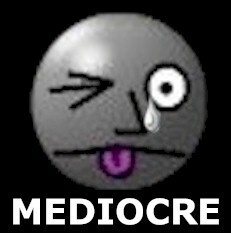 A misspelling of the adjective "mediocre". You know, I think the # of typos has increased in written text (including books published by big book companies - yeah, go figure), since the dependence on spell-check. Yeah, the spell-check things are decent, but they can't interpret. I am uncertain how this post got re-published with today's date... it was first posted years ago! I have been updating the labels on a bunch of my old posts... that must have done it somehow by accident. John - I think it was in 2011 but I'm not entirely sure.